Horst informed us during the daily call-in yesterday evening that bad weather continues at Dye-2. 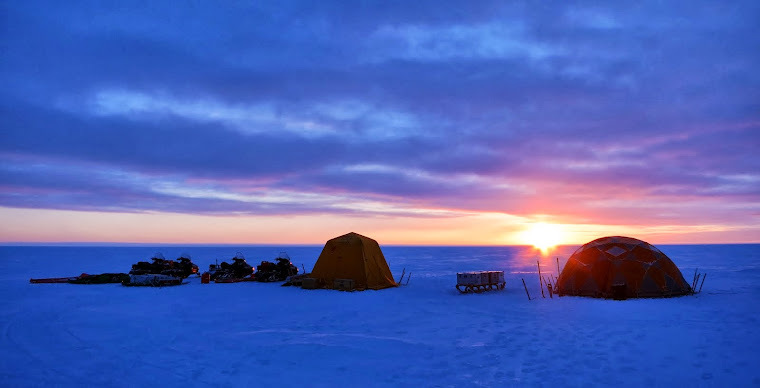 We created a stock of ice cores before the rotation of the crew, just so that Mike, Horst, Karen and Alex would be able to keep production (core sampling) up during the upcoming period of bad weather - during which there is no leaving the camp. But apparently even core sampling was difficult to do behind the snow wall that functions as a wind shelter. They did manage to process one full core though, which takes half a day in good conditions (slicing up 16 meters into 10 cm sections, weighing it and put some of it in small sample tubes). Also, the last of the snow compaction equipment was constructed in the work tent, ready to be installed whenever weather calms down again. This picture shows one of these devices already installed at KAN_U; it is drilled down 15 m.
In the mean time the rest of us are still in Kangerlussuaq, except for Liam who returned to Copenhagen yesterday evening. Babis is helping out Andreas Mikkelsen, valued member of last year's campaign, who is currently re-installing a river-discharge station at the Kangerlussuaq bridge that was washed away last summer during extreme melt (see the video here). Mark is packing up and shipping out the IMAU snowdrift equipment that was running at KAN_U over the winter. I, on the other hand, was hoping to fly to the last of the GEUS weather stations (part of the Greenland Analogue Project) in the region by helicopter. But this got postponed once again... Yesterday because the pilot was suffering from from food poisoning (hooray for local cuisine), today because of low clouds and snowfall. Tomorrow we try again! We are running out of time though - planned departure is Friday!